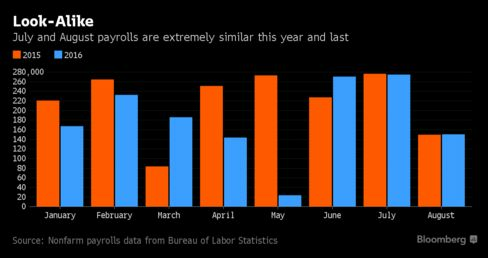 Payrolls slowed in August following a July surge. After preparing for an interest-rate hike all year — with especially high hopes for June — markets are looking toward December. Many economists expect the Federal Reserve will use its September meeting to get its members on board and signal its next move. 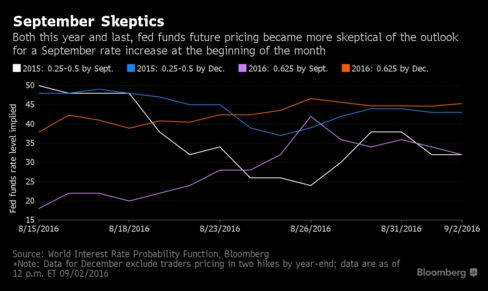 Like last year, the Fed is facing a September-or-December dilemma. There are important differences between 2015 and 2016, because last year an August yuan devaluation heightened international risks and this year a U.S. presidential election looms on the horizon. Still, in many regards the economic environment that the Fed is operating in as it moves toward a rate increase is remarkably similar. Here, in charts, are the likenesses between this year and last, plus one all-important difference. Exhibit A: Friday’s payrolls report showed a slight retreat from the recent trend that was pretty much identical to what happened last year. The 2015 data reflect a slight downward revision for August, which was initially reported at 173,000. 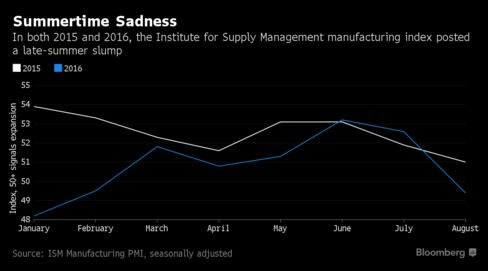 Manufacturing is also following a similar trend to last year, exhibiting a slump in August, based on the Institute for Supply Management’s index. This year’s weak number raises the risk that a third-quarter growth rebound will be weaker than anticipated. Signs of softness have caused markets and economists to walk back their expectations of an imminent rate increase time and again — and market-implied probabilities of a rate hike are basically in line with where they were last September. While international and domestic uncertainty kept the Fed from hiking rates until December last year — and it looks like a similar story-line could play out this year — it’s important to note that it’s not a foregone conclusion. The Fed could also lift rates at its meeting in early November, though that seems unlikely one week before the presidential election and during a meeting that has no scheduled press conference with Chair Janet Yellen. 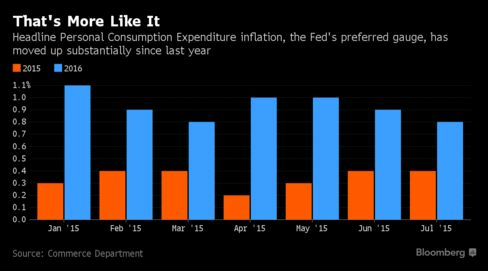 There’s one crucial factor that should make the Fed feel better about their situation than they did at this point last year: Headline inflation remains below the committee’s 2 percent target, but it is double its 2015 level. That’s an important consideration, because Yellen and her colleagues have made it clear that they feel pretty good about the job market — but they’ve been holding out for a move up in price pressures. That said, these numbers are still definitely not at the Fed’s goal. “It seems to me that if you’re wavering between September and December and one of the main impediments to going has been inflation, the September meeting doesn’t quite feel ripe to them,” said Stephen Stanley, chief economist at Amherst Pierpont Securities LLC in New York.